Haq's Musings: Indian Economy: Hard or Soft Landing in 2011? 2. India's FDI has declined by a third from $34.6 billion in 2009 to $23.7 billion in 2010. Its current account deficit is being increasingly funded by short-term capital inflows (FII up 66% from $17.4 billion in 2009 to $29 billion in 2010) rather than more durable foreign direct investment (FDI), posing a risk to external balance and funding of gap, according to a recent warning by Goldman Sachs. "Nearly 80 per cent of the capital inflows are non- FDI related. Given the excess spare capacity globally, FDI may remain weak going forward," the Goldman note said. Never mind who has posted the article, the Indian economy IS weakening. I have verified all the facts in this post and they are true. The current account deficit HAS trebled over the past year, mainly due to our increasing trade imbalances. Having a CAD of more than 3% is an alarming situation. 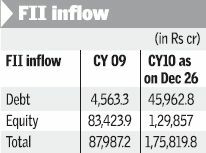 The Indian economy has also liberalized so that we are allowing greater FII inflows. We need to correct these problems otherwise the next global economic slowdown will have a much greater impact on India than the previous one. Indian manufacturing industry needs to be given a boost and domestic companies need to be given a helping hand in dealing with international competition. Though the situation is not as alarming as the OP has suggested, yet, what has been pointed out is a major cause for concern has has to be dealt with sooner rather than later. Nobel Prize winner Joseph Stiglitz commented that India should take appropriate measures to curb the inflow of short term investments in the form of US dollars. This loosely controlled inflow of US dollars into the Indian market is with the purpose of investing and reaping gains inherited from the prospects of developing countries such as India. Stiglitz stated that since most of the investments are short term in nature, they do not in any manner contribute to the rise in employement rates of the country. Also, since they are can be withdrawn on a short notice, he said that possibility of a sudden withdrawal cannot be discredited. Stiglitz went on to remind that the economic crisis of 1990 was mainly brought on by the unexpected withdrawal of investments by short term investors. India’s Economic Advisory Council, headed by C. Rangarajan has stated that India can withstand an inflow of investments of up to $7000 crores, judging by the current market standards. There is a prominent rise in the inflow of funds and investments from abroad to the Indian share and debenture market. An investment of $7000 crores can work to null the trade deficit in India amounting to around $5000 crore dollars. The remaining money from foreign investments can be set aside as a reserve, he said. The recent unexpected surge in the flow of investments to India can be traced to the financial bail-out package proclaimed by America. It has to be noted that many countries including China have obstructed excess inflow of investments into their economy stating that this may lead to a tilt in the economic balance in the country. Currently, with China rising to a superpower status, and India on its heels as a close competitor, it is crucial that the Government of India takes some time out to ponder over the words of the great mind that Joseph Stiglitz is. Is the Indian economy similarly vulnerable in 2011? Nope! Even if policy makers do nothing FX reserves cover ALL FII/FDI and leave $50bn for contingency. And oil prices are falling thanks to china slowdown and more problems in the eurozone and rapid increase in Iraqi crude output currently exempt from opec.. Besides the ruling class of India is a lot lot more financially literate than Pakistan's. Anon: "PAkistan in 2008 was a net DEBTOR and had a tiny FX reserve pile and thus was unable to survive a sudden spike in oil price and deterioration of investment sentiment..."
Pakistan had reserves to cover about about 7-8 months of imports, and India has about 12-14 months of imports. So it is true that India has significantly more cushion now than Pakistan had in 2008. But confidence is a fragile thing. As soon as the reserves begin to evaportate, so does the investor confidence, causing a rapid deterioration in an economy increasingly depdndent on investment, particulaly the hot money (FII) that leaves on the first signs of trouble. And as long there is spare capacity in the world, the amount of FDI everywhere will remain limited until demand picks up in US, Europe and elsewhere. What India must do now is to raise interest rates, slow credit expansion and bring inflation under control to regain fscal and monetary discipline. This will ensure a soft landing in 2011, and avoid a crash. Only if you really believe in free trade. For eg:There is massive spare capacity in the auto industry globally BUT all major companies are opening plants in India because we have 100%+ tarrifs against imports. It is a similar story in many other products as long as consumption in India grows FDI will follow for nothing else but to sell in India. Pakistan had reserves to cover about about 7-8 months of imports. Notionally yes but most of the FX was tied to servicing external liabilities.So the net free FX available for cushioning mports was 3-4 months and the oil price rally was the proverbial last straw that broke the camel's back..
Also India's investment grade rating enables it to raise funds abroad if it so chooses Japan's central Bank and RBI have a agreement to that effect..
1.Glut is capital goods production globally means we get capital goods at firesale prices now and thus build capacity on the cheap. 2.The multiplier effect on the economy is mainfold i.e $1 of cap goods import=$10 in export over a 10 year period using that capital good. 3.We need growth to increase tax revenue to bring down the fiscal defecit. Anon: "Also India's investment grade rating enables it to raise funds abroad if it so chooses Japan's central Bank and RBI have a agreement to that effect.."
History tells us that ratings can change very quickly along with confidence...leading to economic crashes. It takes a lot of effort to maintain confidence in economy, including fiscal and monetary discipline which is slipping in India, along with double-digit and rising inflation and growing twin deficits. Umm...India has more forex reserves than foreign debt. OTOH, Pakiland's foreign debt is 53 billion $ and it's reserves are 16 billion. "But confidence is a fragile thing." confusing your wishful thinking with reality...color me surprised..
Anon: "OTOH, Pakiland's foreign debt is 53 billion $ and it's reserves are 16 billion"
The size of the foreign debt is not the issue...the issue in India is its mounting current account deficit funded increasing (upto 80% recently) by short-term capital inflows which can dry up quickly as we saw in the 1997 Asian financial crisis. "NEW DELHI - India’s November exports increased by 26.8 per cent to $ 18.9 billion year-on-year, prompting government to exude confidence that overall shipments this fiscal may breach the target and touch $ 215 billion. 10 yrs ago I remember Pak was about 18 billion and India at 40 billion. We barely moved to 40 billion and India moved to 215. Of course facts like this do not bother Riaz as much as wishful thinking that Indian economy would crash in 2011 proving that Pakistan is not a failed country. There is no need to slam Riaz the moment he expresses skepticism of India, whether he has good faith or not. In Economics, skeptics have been much more accurate than optimists. The stories I hear from India from direct sources tell how much messed up everything there is - like quadrupling the price of many food items - and this is happening in a trillion dollar economy. I hear stories of people defaulting on their loans because house prices are not appreciating as it has been, students dropping out of engg. colleges in 3rd year because they do not get easy loans anymore etc. That per se is alright - but in India, some of these same people make quite a lot of noise when they get something trivial and that is part of their nature. Foreign car companies setting up businesses to satisfy domestic demand would itself create lot of employment oppurtunities. Nevertheless I doubt whether this is sustainable in the long run, unless India can export some of these cars as domestic demand will saturate at some point..The fact is that India never expereinced a full blown crisis since 1991. Dotcom bubble affected only IT which at that time employed even tinier part of labour force and Indian banks were in good shape when entering the current crisis. Food price inflation and social unrest are the biggest long term threat to India as I see. DC: "India’s November exports increased by 26.8 per cent to $ 18.9 billion year-on-year, prompting government to exude confidence that overall shipments this fiscal may breach the target and touch $ 215 billion." One month does not make a trend. 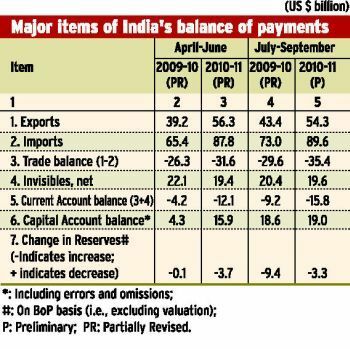 India' exports have increased, but the imports have increased faster, creatng large trade deficits contributing to widening current account deficits. And India's current account deficit is being increasingly funded by short-term capital inflows (FII) rather than more durable foreign direct investment (FDI), posing a risk to external balance and funding of gap, according to a recent warning by Goldman Sachs. "Nearly 80 per cent of the capital inflows are non- FDI related. Given the excess spare capacity globally, FDI may remain weak going forward," the Goldman note said. India's reliance on short term capita flows is raising alarms among the investment community, they see it as a prelude to the kind of crash that occured in Asian economies in 1997. 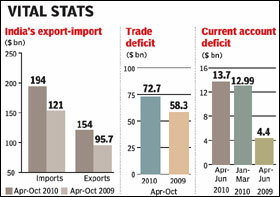 Nov exports weren't out of the blue but an accelerating rate strating in sep 2010. "Nearly 80 per cent of the capital inflows are non- FDI related. Given the excess spare capacity globally, FDI may remain weak going forward,"
BUT Current account deficit is 100%funded by remittances and FDI whith about 5-10 billion to spare. “This year, the public opinion in Pakistan is not hopeful as only 13 percent think that 2011 will be a year of economic prosperity while 34 percent expect it to be a year of difficulty thus giving a negative score of –21 percent on Net Hope,” said Chairman Gallup Pakistan Dr Ejaz Shafi Gilani. “The devastation caused by floods during the middle of the year created a mood of economic pessimism among the public, despite the fact that the country fought this calamity with courage and showed extraordinary resilience,” Dr Ejaz added. As the new century enters its second decade, both economic data and perception data suggest that while wealth is still concentrated in Europe and North America, while there is a shift of power and prosperity from the West of the 20th Century to the East, he added. He said these findings have been derived from one of the largest global surveys covering 53 countries across all continents including all the G7 countries, the four countries of emerging BRIC (Brazil, Russia, India and China) and another 45 countries from Asia, Africa, Latin America, Australasia and including Pakistan. Together, a sample of over 64,000 scientifically selected men and women were interviewed by leading pollsters associated with Gallup International. This is the second global survey, which the Group has conducted and released during this month. The key question in the global survey was: “Would you say that 2011 will be a year of Economic Prosperity, Economic Difficulty or remain the same.” At a global level 30 percent of the world expects that 2011 will be the year of prosperity and 28 percent expect it to be the year of economic difficulty, while 42 percent think the economic situation will remain unchanged. The hopefuls outscore the pessimists by 2 percent. That is the net Global Hope Score. The data shows that global hope is highly concentrated among the rising economic powers, the so-called BRIC. The Hope Score for this Group is 35 percent. In sharp contrast, the Hope Score for the rich countries of the world, known as the G7 (USA, Canada, Germany, France, UK, Italy, and Japan) is in the negative: -19 percent. Among them, the Pessimists (36 percent) outscore the Hopefuls (17 percent) by 19 percent points. Briefing the journalists about the survey here Wednesday, Dr Ejaz Shafi Gilani chairman Gallup Pakistan claimed that comparing the survey data with India, it must be noted that Hope Score are volatile and can make sharp jumps in short years. “This would be true of the mood in India. In the latest survey popular opinion in India shows a Net Hope of 24 percent. anon: "So much for declining investor sentiment..."
I don't you really appreciate the alarms that the following Mobius statemmnts raise in the minds of people like Nobel Laureate Stiglitz and investment advisor Mike Shedlock who I quoted in my post. "The Indian government has been battling high inflation for a while now and Mobius says he expects some government action next year, but does not see any aggressive action being taken." "The money flow into emerging markets will continue. The total flow of course is increasing with the flood of money hitting all of these markets. As money supply in the US, Europe, Japan, China and in India is going up, there is need for a home for this money and emerging markets are going to get their share." The first of these statements says that Mobius believes that Indian regulators are and will continue to be behind the curve in reigning in inflation which could spell disaster for the Indian economy. The second of the above statements should worry you about the potential for the kind of disaster that hot money caused during the 1997 Asian financial crisis. Business cycles have not been canceled in India and other emerging economies. The Indian economy is just as capable of overheating as developed economies. Hot money can and will spell disaster in the absence of controls on capital flows. Not really it means that the Indian regulators are seasoned experts who like to think things through instead of stupidly slamming the breaks at the first sign of troubl like Bank of Japan did in 1989 effectively causing an economic collapse from which Japan hasn't yet recovered. Only if the hot money is being used to finance deficits which it is NOT currently and unlikely to in the future in any significant way. None of this was true in ASEAN in 1997..So why should i worry? Infact you should be happy too unlike Pakistan whose economic collapse or success will have zero impact on the World (at least economically). India's theoretical collapse would send shockwaves around the world given that it is more than twice the size of all ASEAN countries combined and is currently contributing around 15-20% to overall world GDP growth. Amen!Notice how well RBI handled the soft landing (growth slowing from 9% to 6% in 2008-09. What makes you doubt their capabilities this time around? Infact Bank of England sends people to take lessons in management from RBI. Anon: "Not really it means that the Indian regulators are seasoned experts who like to think things through instead of stupidly slamming the..."
Are we talking the same RBI that failed in 1966 and 1991 BoP crises? Anon: "Only if the hot money is being used to finance deficits which it is NOT currently and unlikely to in the future in any significant way." You are wrong! Read the Goldman report again. I have provided a link to it as published by Economic Times. Anon: "We have enough FX to cover a Complete withdrawl of ALL FII from the market with $80 billion to spare...None of this was true in ASEAN in 1997..So why should i worry?" Rating agencies will downgrade India, rupee will collapse, analysts will turn negative, and investors will rush to the exists as soon as there's a significant drop in reserves. That's how crises spiral out of control even in strong economies even in the developed world. 1991 crisis was a watershed in the Indian economy caused by the collapse of the USSR (our closest ally),high oil prices and a collapse of remittances from the gulf due to gulf war 1. It also negotiated India's entry into the WTO as a founding member(ahead of China) in 1995 on very concessional terms which allowed us to keep our protective tarriff barriers while enabling access to western markets and technology. Exactly how did the RBI fail?? Anon: "The RBI handled it brilliantly "
You are talking about RBI's response after the 1991 BoP crisis erupted, not RBI's inability to prevent the crisis in the first place. Anon: "No country with enough FX reserves with its central bank to be a net creditor to the world has EVER had a run on its markets..."
How much FX is enough? A year's worth of imports? And what happens as rapidly deplete. But India is not a "net creditor"...India is a debtor nation. "A country’s current account consists of merchandise trade (exports and imports of goods) and the invisible trade — income and expenditure from export and import of services, profits earned on investments and remittances by workers. 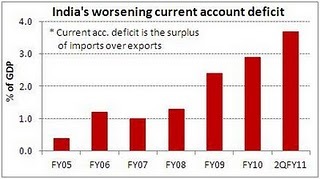 A deficit would occur when total imports are greater than exports. A deficit implies that the country is a net debtor to the world. " Read more about it in the recent RBI report. 1.Prevented the collapse of the USSR. 3.Miracurously lowered international oil prices. The 1991 crisis in the background of Kashmir in flames,Rajiv Gandhi assasination and the great USSR no longer there to protect us could have broken the country,caused a lost decade or led to latin america style hyperinflation.. But nothing,,it was all over in 8 months and the economy actually grew in 1991 itself...Hats off to the RBI. Pakistan can only dream of such macro economic management capability. This is the case with India. The economic times journalist got is wrong. Depends on what is causing inflation.It it is supply side constraints then yes a rate hike is in order but if it is for certain structural reasons then a policy change is in order.For eg onion prices have crashed after we banned exports and eliminated tarrifs on imports. Non oil related export growth > import growth since sep'10 AND most of our oil is bought on long term contracts not at international spot prices..we being the world's fourth largest importer and the closest major market to middle eastern oilfields usually buy oil on better terms than other nations and our refineries can process much cheaper heavy venezuelan crude which sells at a steep discount. 2.All FIIs need to register and have to adhere to strict investment guidelines failing which they are liable to be banned. 3.Short selling is banned in a wide array of market instruments. 4.Most Indian FIIs are Pension funds and the like which invest for the long term according to transparent alllocation procedures. 5.ECBs by private corporations need to be approved by RBI on a case to case basis. The above restrictions were put in place well before the financial crisis when deregulation was the prevailing fad.. So? Corporates are borrowing long term to fund expansion at home and abroad,buy tech and companies and move up the value chain.ROCE India Inc>>China Inc so the debt is being serviced from revenue..On the whole debt/revenue of India inc is DECLINING. What's more most of these loans are raised with high penalty clauses if the lender chooses to call in the loans. Your expert opinion is needed here. Anon: "Your expert opinion is needed here.IMF warns about Pakistan's deteriorating economy"
This post is about Indian economy, not Pakistan's economy. IMF is on Pakistan's case, and I expect some basic reforms to happen there under pressure. There is currently no such pressure on the Indian policy makers to get their act together to address India's rising inflation and growing twin deficits. Pakistan's conomy is so far down that the only place for it to go is up from here. The first indication of it is the fact that Pakistani stocks outpaced Indian stocks by about 2:1 in 2010. 1.december exports up a whopping 36% this year CAD will be less than 3% of GDP. 2.windfall of 3G licenses and buoyant tax revenues to keep fiscal defecit under check. riaz very conveniently ignoring oct nov dec export figures?? I don't think India should trade much with Pakistan..
We have inherited more of an island nation psyche from the UK.If you think about it all of India's borders are fenced and electrified and 99%+ of trade and movement happens via sea and air.. I don't think that's such a bad thing if Pakistan was a major trade partner accounting for say 15-20% of trade we would be very badly affected economically with Pakistan's current chaos which looks likely to continue for this decade(Lost decade 2.0). Instead we are for economic purposes an island nation with next to no trade with our incompetent neighbours and good sea links to EU and the english speaking world.We are growing at 9%pa so this current arrangement works! Anon: "If you think about it all of India's borders are fenced and electrified and 99%+ of trade and movement happens via sea and air.."
So you are ok with Pakistani decision to cut overland onion exports to India? Absolutely!Infact that is yet another reminder for why PAkistan can never be trusted as a reliable trade partner.I mean just imagine if it was something critical like oil or gas supplies..we would really be in a soup then wouldn't we ?.. In any case onion prices have crashed a week back so imports are no longer necessary..but thanks again for the reminder of PAkistan's (lack of)bankability..
Much better to keep all trade on the sea and build a super blue water navy to protect it..which we are doing anyway. Anon: "Much better to keep all trade on the sea and build a super blue water navy to protect it..which we are doing anyway. " Your blue water navy is a joke. It couldn't even stop a few terrorists who attacked Mumbai in 2008 by entering via sea route on a dingy. And adding a piece of old Soviet junk like Adm Gorshkov will ony make your navy more vulnerable! I wonder you'd actually like to back up the comment about the Indian Navy being a joke. Because, I'd go so far as to say that its the strongest navy around after the P-5 navies. And by 2015-16, it will rival the British and French navies and have a combined tonnage second only to the USN and PLAN. As a matter of fact, over the last five years the Pakistani Navy has become a peripheral threat to the IN where it once was the primary adversary. As for the strawman about the terrorists sneaking through, I suggest you read up what coastal policing implies and who's responsibility it is. Do you think the US Navy is 'a joke' because illegal immigrants from El Salvador, Honduras and Cuba still manage to sail to US shores, or that the US Army is a joke because it cannot stop illegal immigrants from Mexico from sneaking through the border, or that the US Air Force is a joke because the 9/11 hijackers succeeded? Rahul: " I'd go so far as to say that its the strongest navy around after the P-5 navies"
I do not define strength in terms of number of ships and weapons and personeel, but in terms of competence, or rather the lack of it ...the latest example of it being what the BBC describes as "one of the navy's most embarrassing peacetime incidents" when a big Indian navy ship ran aground near Mumbai close to home port. Rahul: "As for the strawman about the terrorists sneaking through, I suggest you read up what coastal policing implies and who's responsibility it is. Do you think the US Navy is 'a joke' because illegal immigrants from El Salvador, Honduras and Cuba still manage to sail to US shores, or that the US Army is a joke because it cannot stop illegal immigrants from Mexico from sneaking through the border, or that the US Air Force is a joke because the 9/11 hijackers succeeded? " Don't kid yourself...most of the illegal traffic is out of India, not into India, with over a million Indians escaping hell hole India every year. The 911 hijackers came to the US legally with visas, they did not take a dingy ride into New York harbor like the Mumbai terrorists just sailed into Mumbai harbor unhinderd. I am getting a sneaking suspicion that you are obsessed with India! We will manage somehow.. Please dont worry about us. Well.. As Gandhi said to the British, leave India to anarchy if you will! I am not enthused about taking advise from you considering your country's track record. We trust our government and if they do not keep our trust we can always vote them out.. Thank God we are a democracy!! p.s - The Economist predicts India's Per capita GDP to increase to 1500 in 2011. (Pak's will stay at 960 by the way).. Please direct your significant intellect where its needed..
KARACHI - Pakistan’s current account has recorded a surplus of $784 million in the first ten months of current fiscal year 2010-11 against deficit of $3.456 billion in the same period of last year due to rising remittances from overseas Pakistanis and steady exports, the SBP reported on Tuesday. The current account deficit lowered to 0.5 per cent of GDP when compared to the growth of 2.4 per cent of GDP during the same period last year. The reduction in the growth of current account deficit was caused by increase in exports and record inflow of current transfers especially workers’ remittances. The current transfer increased to $12.907 billion in Jul-Apr FY11 from $10.458 billion during the same period of previous fiscal year. According to balance of payments statistics released by the State Bank of Pakistan yesterday, as on April 30, 2011 current account balance without off transfers amounted to $271 million against $3.866 billion over the equivalent period of FY10. Trade account, which is the largest component of the current account, declined to $8.285 billion compared to $9.292 billion. Balance of goods and services stood at $9.677 billion during the first ten months of current financial year against $11.229 billion in the past year. Total goods exports rose to $21 billion during Jul-Apr FY11 from $17 billion of the reported period of the previous year while imports also up $29 billion from $26 billion. From July 01 to April 30, 2011, capital account dropped to $86 million against $154 million while financial account declined to $412 million against $3.533 million due to delay in IMF funding and below than expected financing from the other international financial institutions. A steep rise in credit; rapid increases in house prices to levels way beyond available income; use of overvalued property as further collateral to demand additional funding from the banking system, resulting in even higher levels of debt; an increase in the amount of credit needed for the marginal growth of gross domestic product; a constrained installed capacity that yields to inflationary tensions; a labor force with double digit wage rises; limitless liquidity flowing into sectors with low productivity, such as real estate; a relaxation of the rules for granting loans; a rapid increase in corporate debt as a consequence of accelerated investment, mergers, and acquisitions, all fanned by the intoxicating feeling that demand will just keep going up; a central bank incapable of containing such a self-complacent liquidity binge, with interest rates far below those recommended by the Taylor rule; a political class living off an apparent bonanza, refusing to carry out the reforms needed to avoid disaster when the cycle eventually changes, ignoring calls for serious cutbacks in spending, or rises in taxes that could counteract the exuberance. Over-reliance on the financial sector. This results from failing to curb increasing credit penetration as a percentage of GDP, dodgy criteria for awarding loans, dubious value of collateral assets, and, in China, the increasing influence of a “shadow banking” sector. October's festive cheer failed to revive car sales during the month as higher interest rates and rising fuel prices kept potential buyers away. Leading car maker Maruti Suzuki India Ltd (MSIL), reeling under the workers strike, was the hardest hit with sales falling to less than half of last year's level for the month. The firm's domestic sales dipped by 52.16 per cent at 51,458 units in October 2011, from 107,555 units sold in October, 2010. MSIL's small car sales (M800, A-Star, Alto and WagonR) fell by 54.86 per cent to 25,009 units against 55,404 units in October, 2010. The compact segment (Estilo, Swift and Ritz), posted a 56.09 per cent dip in sales to 10,859 units. Sales of DZiRE decreased by 48.14 per cent to 5,001 units and SX4 fell by 83.81 per cent to just 320 units. MSIL sold only three units of its luxury sedan Kizashi. India's number two car maker Hyundai Motor India Ltd (HMIL) reported a 4.95 per cent drop in sales to 33,001 units from 34,720 units in October last year. "We have seen that sales get a boost in the festival season, but this year, sentiment has been tepid. We don't expect a major upswing in the near future, the challenging economic environment is affecting industry," Arvind saxena, director (marketing and sales), HMIL, said. In the A2 segment (Eon, Santro, i10 and i20), the company sold 41,204 units, while in the A3 segment (Accent and Verna), sales stood at 6,929 units. While the new Santa Fe SUV attracted 190 buyers its small car Eon has received more than 9,000 bookings till date. RH: "But India is not a "net creditor"...India is a debtor nation. A current account deficit (CAD) does not AUTOMATICALLY "imply that the country is a net debtor to the world". It depends on how the CAD is financed. If it is financed by DEBT, then yes, the country is a net debtor. But if it is financed by EQUITY, then the country may not be a net debtor. So how can we tell how a country is financing its CAD? The easiest way to tell for most developing countries (non hard-currency states) is to compare their Foreign Exchange Reserves (FXR) of currency, sovereign debt and gold to their Total External Commercial Debt (TECD). (B) If the FXR= TECD, then the country is neither a creditor nor a debtor. (C) If the FXR<TECD, then the country is a NET DEBTOR. (A) Thailand- FXR is 200 Bln$, TECD is 100 Bln$, therefore Thailand is clearly a NET CREDITOR. (B) India- FXR is 295 Bln$, TECD is 290 Bln$, therefore India is neither a creditor nor a debtor in any significant way. (C) Pakistan- FXR is 14 Bln$, TECD is 50 Bln$, therefore Pakistan clearly is a NET DEBTOR.